Last Tuesday I had the honor of being a guest in Political Vindication‘s Heading Right Convention. They now have the speeches from the invited speakers up at the Heading Right Convention website. Here‘s mine. While you’re there, please vote for my podcast. Thank you. Obama talking to Raul Castro? Humberto Fontova, writing at WND, asks Is Obama talking secretly with Raul Castro? Dr. Rens Lee explains that the buzz was reported by both highly placed Cuban officials and by an experienced Western diplomat posted in Havana. Lee also cautions against an outside chance that the report is simply wishful thinking from Cuban officials based on Obama’s Castro-friendly campaign promises. I lean more towards the wishful thinking theory, too. McCain had CAKE on his birthday. Cake, I tell you! Maria sent this, a particularly pungent sample of the level of discourse at MSNBC. Michael Moore & Olbermann are shocked, SHOCKED! that McCain was insensitive enough to eat cake while Katrina was hitting New Orleans. Not that Moore is insensitive, nooo sireee… he won’t eat cake while the storm he wishes would come to New Orleans gets there. He just calls Gustaf ‘Proof There is a God in Heaven’ because he hopes Gustaf will hit NOLA during the RNC. Your god is not my God, Michael. CORRECTION: I just heard from the store who sold her the shoes! Red shoes for the acceptance speech. Perfect. As you may recall, McCain wears Ferragamos. The allegation against Palin, “undercuts one of the points they are making that she is an ethical reformer,” said Democratic state Sen. Hollis French, who is managing a $100,000 investigation into the firing of Walter Monegan. 1. Running on a clean-government campaign in 2006, Palin upset then-Governor Murkowski in the Republican gubernatorial primary. 2. Ending the bridge to nowhere and the gubernatorial private jet. vs firing Monegan, her appointee. Weigh that against Ayers, Rezko And the Iraqi Billionaire, if you are all for hope and change. Sarah Palin poses more danger of creating world-destroying black holes than the Large Hadron Collidor. Sarah Palin makes Andrew Sullivan regret some key life choices. Sarah Palin wears glasses lest her uncontrollable optic blasts slaughter everyone. Sarah Palin’s presence in the lower 48 means the Arctic ice cap can finally return. More, much more where that came from. Bikers and Barbarians for Sarah Palin, via the Baron. 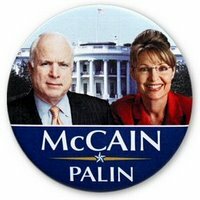 Palin, McCain’s VP choice!!! HOORAY!! Post updated througout the day. Barack and Joe vs. John and Sarah: Whatta Fight! Matt Keller at Facebook: The Challenge! Create a PalinBoy/Girl video with lyrics! I had the honor of being a panelist in Jazz Shaw‘s podcast along with Lady Logician, Joe Gandleman and Ed Morrissey. She also noted her efforts to fight corruption and highlighted her opposition to a much-derided congressional earmark for her state that Sen. McCain loves to hate as well. “I told Congress ‘thanks but no thanks’ on that bridge to nowhere,” she said. Gov. Palin also took on her state’s political establishment that had been rocked by an FBI corruption investigation. Welcome to the party, PUMAs! More from Ed and James. With Russian tanks now presiding over the dismemberment of the Republic of Georgia, can a lame-duck Bush administration — weary from its long drubbing by critics over Iraq and eyeing the exit door — rise to the challenge Russia has chosen to pose to the Free World? To understand the nature of this challenge, consider that the distance between Baghdad and Tbilisi is barely 578 miles, less than the distance between New York City and Chicago. Iraq and Georgia, both of which have democratic governments, are sandwiched between Iran and Russia, two of the most authoritarian governments in the world. Russia has been collaborating with Iran to strengthen the latter’s nuclear program and its military. It is also steadily arming Venezuelan strongman Hugo Chávez. Russia’s invasion of Georgia came exactly one month after Iran test-fired its Shahab III intermediate ballistic missile in order to intimidate neighbors like Israel and Iraq, and two weeks after Mr. Chávez traveled to Moscow to formalize a “Strategic Alliance” with Prime Minister Vladimir Putin and President Dmitry Medvedev. Meanwhile, Iran’s proxies remain the principal threat to peace in Iraq — while on the other side of the world, evidence mounts of Mr. Chávez’s links to the terrorist group FARC, which threatens neighboring Colombia. Coincidence? Iraq, Georgia and Colombia are battlegrounds in a new kind of international conflict that will define our geopolitical future. This conflict pits the U.S. and the West against an emerging axis of oil-rich dictatorships who are working together to push back against the liberalizing trends of globalization. One of their prime objectives is toppling or undermining neighboring, pro-Western democracies. A broad strategy of targeted economic sanctions and multilateral diplomacy, backed by U.S. military power — together with a determined effort to push down oil prices by expanding supply and strengthening the dollar — can introduce a note of sober realism to the strategy of this new axis, and force them to realize how limited and vulnerable their source of money and power really is. However, the most important strategy right now is to secure democracy’s vital new flanks — Iraq, Georgia and Colombia. By shoring up and strengthening, rather than abandoning all three governments, the U.S. will send a clear signal that liberty, not tyranny, is the wave of the globalizing future. In today’s podcast at 11AM Eastern, my guest Jason Poblete and I will talk about the challenges this presents to the US, and will preview the upcoming Republican National Convention. 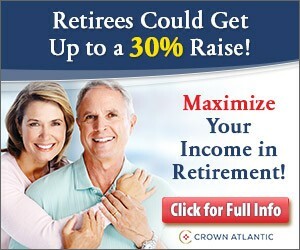 Chat’s open at 10:45AM and the call-in number is 646 652-2639. Join us! Former London mayor Ken Livingstone has got himself a nice little earner – from his old friend and fellow socialist, Hugo Chavez (pictured right with Livingstone). The Venezuelan president has invited him to work as a consultant on policing, urban planning and transport in the country’s notoriously badly-run capital, Caracas, in the run-up to local elections in November. It is two years since Livingstone and Chavez first attempted an arrangement between the two capitals with a deal to supply London with cheap fuel for its bus fleet in return for advice on city management. When Boris Johnson became Mayor in May, he made the cancellation of this agreement one of his first priorities, at the cost of £7m in compensation. Yesterday, the mayor’s office said of Livingstone’s new arrangement: “Boris Johnson made it clear during his election campaign that he did not want to be on the payroll of Hugo Chavez and did not believe a poor South American country should be subsidising one of the wealthiest cities in the world. Some might call this arrangement the reverse of former NY City’s Rudy Giuiliani’s national security expertise. And I guess that £7m had to go somewhere after all. Questions about Ayers? Denounce Kurtz! Jim Lindgren posts that Obama Campaign Denounces Kurtz To a Much Greater Extent Than Ayers, while Steve Diamond posts on how the Obama Campaign Harasses WGN Radio Host. Most recently, Dr. Kurtz has turned his attention to a subject that Global Labor has been exploring – albeit from a left perspective – the relationship between Barack Obama and Bill Ayers particularly on the $160 million six year long Chicago Annenberg Challenge (CAC) from 1995 to 2001. In fact, Kurtz was in Chicago this week to examine the records of the CAC held at the University of Illinois at Chicago (UIC). UIC had invited him to look at the records and then, very oddly, revoked their invitation after a discussion with the donor of the records. Then they reversed course again and invited him back, along with a host of mainstream media representatives who were now paying attention to this issue for the first time. Caller after caller to WGN read off talking points provided them by the Obama campaign alleging that Dr. Kurtz, and by implication and sometimes directly, Milt Rosenberg, was “smearing” Barack Obama and finding Obama “guilty by association.” They also accused Kurtz of lying. Yet, when pressed for specifics, these callers had none. Now keep in mind for those of you not familiar with the Rosenberg show: it has run for decades and has always been thought of as a quiet sober discussion space; generally conservative but usually open to a range of views. Apparently not much effort was made to actually refute the charges, just to shut down the show. Why this ginned up outrage? But Ayers and others claim it was a success – no doubt because it helped them in their battle with the Mayor of Chicago, Richard Daley Jr. who was trying to wrest control of the Annenberg Challenge grant away from Ayers and Obama. Daley was also trying to crush the Local School Councils set up in 1988 after a campaign that Ayers and Obama both participated in. Those Councils were aimed to be a watchdog over the Teachers Union and the School Board. They were failing too and Ayers and Obama viewed the CAC money as a conduit to prop them up. That must be a difficult problem for the Obama camp to swallow – they pushed their candidate to deny, deny, distance, distance, when, in fact, they long knew of the close political relationship between Ayers and Obama. For all we know, the relationship continues. Ayers backs a key policy proposal of Obama education advisor, Linda Darling-Hammond: to wit, the repayment of the alleged “education debt” to people of color. The thing is, these are not baseless attacks, Kurtz is not s “smear-merchant”, and the political discourse is lowered when a candidates’ minions call to insult a talk-radio host. Stanley Kurtz is an adjunct fellow of Hudson Institute and a fellow at the Hoover Institution with a special interest in America’s “culture war.” In addition to his regular contributions to National Review Online, Kurtz’s writings on the family, feminism, homosexuality, affirmative action, and campus “political correctness” have appeared in Policy Review, The Wall Street Journal, and Commentary. Before turning his attention to America’s cultural battles, Kurtz was a social scientist specializing in family life and religion. He received his Ph.D. in social anthropology from Harvard University and later taught at Harvard, winning several teaching awards for his work in a “Great Books” program. Kurtz was also Dewey Prize Lecturer in Psychology at the University of Chicago. If Obama or his campaign had ever denounced Ayers with the fervor that his campaign has now used in denouncing Kurtz, Obama wouldn’t be having trouble on his connection to Ayers. We know for a fact that Ayers is an unrepentant terrorist who in this interview at the Chavista CIM in Caracas explicitly stated that leaving the terrorist life was a setback to him and the movement. 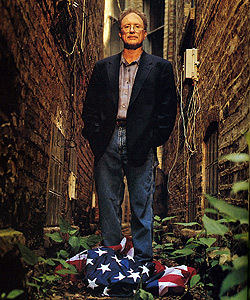 Rick Moran also reminds us of Obama’s alliances with other radicals, like the Maoist New Party, to advance his carreer. Just this morning I was posting about Richard’s questions regarding another shady character in Obama’s resume. For all Obama’s talk of hope and change and post-partisanship and post-racialism, his campaign — whose very call for “unity” of a type that supresses unfavorable speech, is proving itself to be an enemy of the very heteroglossia progressives always ostensibly champion. But, as is the case with even the best postmodern novelists, the appearance of openness is one that needs to be carefully constructed and maintained, with the narrative always controlled by an abiding intent — even if that intent is something so seemingly open-ended as a desire not to intend. Outdoors from the DNC, an ABC news reporter got arrested while investigating the role of lobbyists and donors at the DNC. More blog commentary at Memeorandum.